Languages are works of art, great libraries, how-to guides for living on planet Earth, windows into our minds and inalienable human rights. 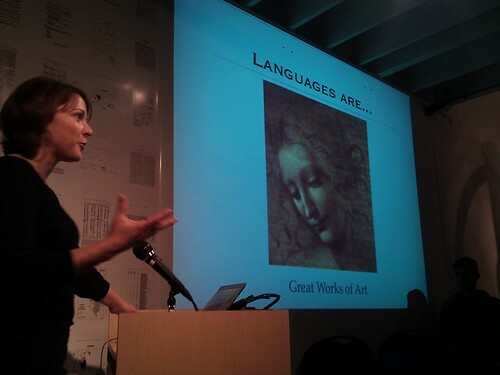 Long Now’s own Dr. Laura Welcher, Director of Operations and The Rosetta Project, spoke on March 3rd to a group of Long Now Members about the beauty, variety and value in the almost 7,000 languages spoken in the world. The event was part of our new Salon Series: occasional, intimate talks held in The Long Now Museum & Store for Members of the Foundation. Laura’s talk was called The Rosetta Project and The Language Commons and in it she discussed several efforts to preserve linguistic diversity around the world. The Long Now Foundation’s role thus far, she explained, has been to develop and manufacture The Rosetta Disk: a durable, nickel archive of linguistic data. Laura also discussed her work with The Language Commons Working Group – a collaboration of linguists, archivists and programmers working to create an open and accessible encyclopedia of languages and linguistic diversity as a tool for teaching, studying, preserving and sharing languages. The full audio of Laura’s talk can be streamed from the player below or downloaded as an mp3. You can also click through the slides she presented in the window below the audio player. View more presentations from longnow.